FROM THE HARD ROCK CAFE IN GOTHENBURG. 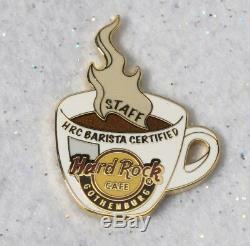 VERY LIMITED EDITION STAFF BARISTA PIN. THOUSANDS OF PINS AND MAGNETS TO SELL - STAY TUNED!! By purchasing from us, you agree and understand this process, and should you not be happy with your item, you MAY RETURN it AT YOUR EXPENSE. This is a NOVELTY hobby. The item "HARD ROCK CAFE GOTHENBURG BARISTA STAFF VERY LIMITED EDITION STAFF PIN" is in sale since Saturday, January 26, 2019. This item is in the category "Entertainment Memorabilia\Music Memorabilia\Rock & Pop\Artists H\Hard Rock Café\Pins". The seller is "pinwizards" and is located in Las Vegas, Nevada.